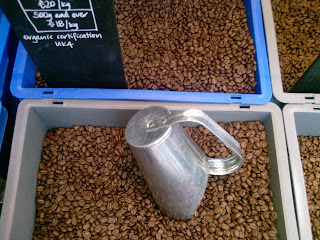 Tales from the Tiny Kitchen: Decaff coffee - too good to be true? Sometimes just the tiniest amount of coffee can make me feel really jittery and quite moody. So, in recent months I've been experimenting with decaff. It's not easy, since I love the smell and taste of coffee so much, and a lot of the decaff versions taste about as appetising as wet cement. I've even had a few brands that leave a nasty aftertaste of burnt rubber. I thought I might have to stop drinking coffee completely, since no decaff seemed to be remotely drinkable. Until recently, that is. My office is quite near to a branch of The Monmouth Coffee Company and their coffee is amazingly good. Just walking past their shop without buying anything takes nerves of steel, as the intoxicating smell follows you down the street. I thought to myself: if anyone can make a decent decaff, they can. I bought a bag of beans and I've been drinking my way steadily through it for the last few months (it takes me a while). I went back today to get some more and asked the serving bloke if their decaff was really free of caffeine - surely there was a catch with something that tasted so good? But no catch, apparently: he reassured me that they remove the caffeine without chemicals using the Swiss Water Process (sounds impressive and I have no idea what this means)...meaning that the coffee only contains about 0.1% caffeine. So I can keep on enjoying my cup of joe without feeling like I'm going to have a heart attack or bite anyone's head off. Result! It's like a night out without beer, curry without heat, a film without large guns and a life without football. You have embraced the darkside, have sided with the Swiss (oh, the irony) and must be immediately taken outside and shot. Is this just a ploy to get me to send you some of these here coffee beans?